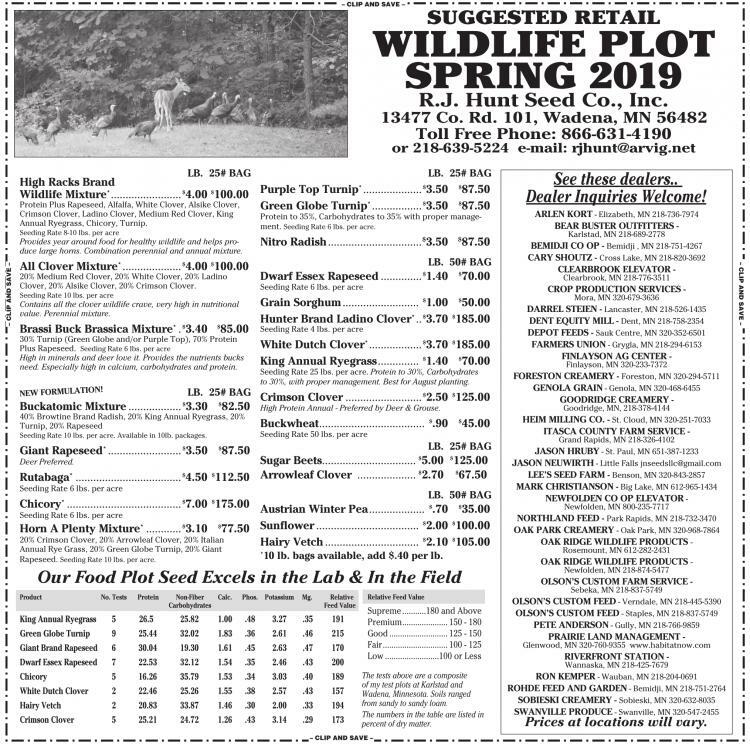 – CLIP AND SAVE – SUGGESTED RETAIL WILDLIFE PLOT SPRING 2019 R.J. Hunt Seed Co., Inc. 13477 Co. Rd. 101, Wadena, MN 56482 Toll Free Phone: 866-631-4190 or 218-639-5224 e-mail: rjhunt@arvig.net LB. 25# BAG High Racks Brand Wildlife Mixture * ........................ $ 4.00 $ 100.00 Protein Plus Rapeseed, Alfalfa, White Clover, Alsike Clover, Crimson Clover, Ladino Clover, Medium Red Clover, King Annual Ryegrass, Chicory, Turnip. Seeding Rate 8-10 lbs. per acre Provides year around food for healthy wildlife and helps produce large horns. Combination perennial and annual mixture. All Clover Mixture * .................... $ 4.00 $ 100.00 20% Medium Red Clover, 20% White Clover, 20% Ladino Clover, 20% Alsike Clover, 20% Crimson Clover. Seeding Rate 10 lbs. per acre Contains all the clover wildlife crave, very high in nutritional value. Perennial mixture. Brassi Buck Brassica Mixture * . $ 3.40 $ 85.00 30% Turnip (Green Globe and/or Purple Top), 70% Protein Plus Rapeseed. Seeding Rate 6 lbs. per acre High in minerals and deer love it. Provides the nutrients bucks need. Especially high in calcium, carbohydrates and protein. LB. 25# BAG Buckatomic Mixture .................. $ 3.30 $ 82.50 40% Browtine Brand Radish, 20% King Annual Ryegrass, 20% Turnip, 20% Rapeseed Seeding Rate 10 lbs. per acre. Available in 10lb. packages. Giant Rapeseed * ......................... $ 3.50 $ 87.50 Deer Preferred. Rutabaga * .................................... $ 4.50 $ 112.50 Seeding Rate 6 lbs. per acre Chicory * ....................................... $ 7.00 $ 175.00 Seeding Rate 6 lbs. per acre Horn A Plenty Mixture * ............ $ 3.10 $ 77.50 20% Crimson Clover, 20% Arrowleaf Clover, 20% Italian Annual Rye Grass, 20% Green Globe Turnip, 20% Giant Rapeseed. Seeding Rate 10 lbs. per acre. – CLIP AND SAVE – LB. 25# BAG Purple Top Turnip * .................... $ 3.50 $ 87.50 Green Globe Turnip * ................. $ 3.50 $ 87.50 Protein to 35%, Carbohydrates to 35% with proper management. Seeding Rate 6 lbs. per acre. Nitro Radish ................................ $ 3.50 $ 87.50 LB. 50# BAG Dwarf Essex Rapeseed .............. $ 1.40 $ 70.00 Seeding Rate 6 lbs. per acre Grain Sorghum .......................... $ 1.00 $ 50.00 Hunter Brand Ladino Clover * .. $ 3.70 $ 185.00 Seeding Rate 4 lbs. per acre White Dutch Clover * .................. $ 3.70 $ 185.00 King Annual Ryegrass .............. $ 1.40 $ 70.00 Seeding Rate 25 lbs. per acre. Protein to 30%, Carbohydrates to 30%, with proper management. Best for August planting. Crimson Clover .......................... $ 2.50 $ 125.00 High Protein Annual - Preferred by Deer & Grouse. Buckwheat .................................... $ .90 $ 45.00 Seeding Rate 50 lbs. per acre LB. 25# BAG Sugar Beets................................ $ 5.00 $ 125.00 Arrowleaf Clover .................... $ 2.70 $ 67.50 LB. 50# BAG Austrian Winter Pea ................... $ .70 $ 35.00 Sunflower ................................... $ 2.00 $ 100.00 Hairy Vetch ................................ $ 2.10 $ 105.00 * 10 lb. bags available, add $.40 per lb. Our Food Plot Seed Excels in the Lab & In the Field Product No. Tests Protein Non-Fiber Calc. Phos. Potassium Mg. Relative Carbohydrates Feed Value King Annual Ryegrass 5 26.5 25.82 1.00 .48 3.27 .35 191 Green Globe Turnip 9 25.44 32.02 1.83 .36 2.61 .46 215 Giant Brand Rapeseed 6 30.04 19.30 1.61 .45 2.63 .47 170 Dwarf Essex Rapeseed 7 22.53 32.12 1.54 .35 2.46 .43 200 Chicory 5 16.26 35.79 1.53 .34 3.03 .40 189 White Dutch Clover 2 22.46 25.26 1.55 .38 2.57 .43 157 Hairy Vetch 2 20.83 33.87 1.46 .30 2.00 .33 194 Crimson Clover 5 25.21 24.72 1.26 .43 3.14 .29 173 Relative Feed Value Supreme ...........180 and Above Premium ..................... 150 - 180 Good ........................... 125 - 150 Fair .............................. 100 - 125 Low .........................100 or Less The tests above are a composite of my test plots at Karlstad and Wadena, Minnesota. Soils ranged from sandy to sandy loam. The numbers in the table are listed in percent of dry matter. See these dealers.. Dealer Inquiries Welcome! ARLEN KORT - Elizabeth, MN 218-736-7974 BEAR BUSTER OUTFITTERS - Karlstad, MN 218-689-2778 BEMIDJI CO OP - Bemidji , MN 218-751-4267 CARY SHOUTZ - Cross Lake, MN 218-820-3692 CLEARBROOK ELEVATOR - Clearbrook, MN 218-776-3511 CROP PRODUCTION SERVICES - Mora, MN 320-679-3636 DARREL STEIEN - Lancaster, MN 218-526-1435 DENT EQUITY MILL - Dent, MN 218-758-2354 DEPOT FEEDS - Sauk Centre, MN 320-352-6501 FARMERS UNION - Grygla, MN 218-294-6153 FINLAYSON AG CENTER - Finlayson, MN 320-233-7372 FORESTON CREAMERY - Foreston, MN 320-294-5711 GENOLA GRAIN - Genola, MN 320-468-6455 GOODRIDGE CREAMERY - Goodridge, MN, 218-378-4144 HEIM MILLING CO. - St. Cloud, MN 320-251-7033 ITASCA COUNTY FARM SERVICE - Grand Rapids, MN 218-326-4102 JASON HRUBY - St. Paul, MN 651-387-1233 JASON NEUWIRTH - Little Falls jnseedsllc@gmail.com LEE’S SEED FARM - Benson, MN 320-843-2857 MARK CHRISTIANSON - Big Lake, MN 612-965-1434 NEWFOLDEN CO OP ELEVATOR - Newfolden, MN 800-235-7717 NORTHLAND FEED - Park Rapids, MN 218-732-3470 OAK PARK CREAMERY - Oak Park, MN 320-968-7864 OAK RIDGE WILDLIFE PRODUCTS - Rosemount, MN 612-282-2431 OAK RIDGE WILDLIFE PRODUCTS - Newfolden, MN 218-874-5477 OLSON’S CUSTOM FARM SERVICE - Sebeka, MN 218-837-5749 OLSON’S CUSTOM FEED - Verndale, MN 218-445-5390 OLSON’S CUSTOM FEED - Staples, MN 218-837-5749 PETE ANDERSON - Gully, MN 218-766-9859 PRAIRIE LAND MANAGEMENT - Glenwood, MN 320-760-9355 www.habitatnow.com RIVERFRONT STATION - Wannaska, MN 218-425-7679 RON KEMPER - Wauban, MN 218-204-0691 ROHDE FEED AND GARDEN - Bemidji, MN 218-751-2764 SOBIESKI CREAMERY - Sobieski, MN 320-632-8035 SWANVILLE PRODUCE - Swanville, MN 320-547-2455 Prices at locations will vary. R.J. Hunt Seed Co., Inc.
LB. 25# BAG High Racks Brand Wildlife Mixture * ........................ $ 4.00 $ 100.00 Protein Plus Rapeseed, Alfalfa, White Clover, Alsike Clover, Crimson Clover, Ladino Clover, Medium Red Clover, King Annual Ryegrass, Chicory, Turnip. Seeding Rate 8-10 lbs. per acre Provides year around food for healthy wildlife and helps produce large horns. Combination perennial and annual mixture. Clover, 20% Alsike Clover, 20% Crimson Clover. Seeding Rate 10 lbs. per acre Contains all the clover wildlife crave, very high in nutritional value. Perennial mixture. Plus Rapeseed. Seeding Rate 6 lbs. per acre High in minerals and deer love it. Provides the nutrients bucks need. Especially high in calcium, carbohydrates and protein. Seeding Rate 10 lbs. per acre. Available in 10lb. packages. Giant Rapeseed * ......................... $ 3.50 $ 87.50 Deer Preferred. Annual Rye Grass, 20% Green Globe Turnip, 20% Giant Rapeseed. Seeding Rate 10 lbs. per acre. Green Globe Turnip * ................. $ 3.50 $ 87.50 Protein to 35%, Carbohydrates to 35% with proper management. Seeding Rate 6 lbs. per acre. to 30%, with proper management. Best for August planting. Crimson Clover .......................... $ 2.50 $ 125.00 High Protein Annual - Preferred by Deer & Grouse. Hairy Vetch ................................ $ 2.10 $ 105.00 * 10 lb. bags available, add $.40 per lb. The tests above are a composite of my test plots at Karlstad and Wadena, Minnesota. Soils ranged from sandy to sandy loam. The numbers in the table are listed in percent of dry matter. Prices at locations will vary.